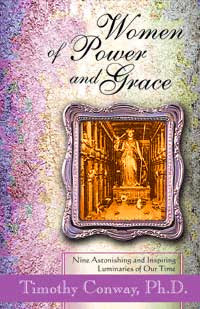 The deeds, miracles, and teachings of these nine beautiful and inspiring female role models, performing miracle healings and ministering divine love and compassion on a par with Jesus and the Buddha, will be an inspiration to those who seek the deepest and most powerful forms of spirituality. This book includes many of their teachings in their own words with special emphasis on the women of India who teach the sublime nondual Vedanta philosophy—one of the greatest achievements in the history of human thought. The stories of these spiritual champions of the highest order will excite the reader with the possibility of his or her own direct God-realization and the fullness of divine love, bliss, peace, freedom, and power. The author says that it has been a great joy to hear from so many readers about how one or more of these holy ones has touched their lives in some real, transformational manner. The author, Timothy Conway, is a spiritual teacher and educator living in Santa Barbara, California. He received double majors in religious studies and psychology from the University of California and M.A. and Ph.D. degrees in East–West psychology from the California Institute of Integral Studies in San Francisco. He has met and studied with many of the most esteemed spiritual leaders of our time and has made a fairly exhaustive study of the world’s sacred literature, including hundreds of rare but crucially important works dealing with the highest stages of enlightenment. ISBN: 81-89658-26-3, Price: Rs. 650; Pages: 352; Size: 5.5 x 8.5 in.